I’ve never been particularly troubled by the sight of empty shops, but the dilapidation is sad if it means the loss of historic architectural details, as it has here, on Bootham. This was once a handsome frontage, but its detailed fancy bits have suffered. They’ve had a memorably amateurish paint job inflicted on them, and have in places gone rotten and dropped off. It’s not often that a planning application cheers me up. Recent experience suggests that they make me feel angry, depressed, and like I want to bang my head against a wall. But I feel some kind of civic duty to have a look every now and then to see what’s planned, particularly now the CoYC planning pages are working properly, and are much easier to use. And hurrah! 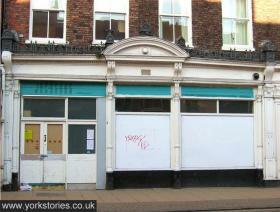 I found interesting plans for this shabby old shopfront on Bootham. Most recently it was a Sainsbury’s Local, but this has now relocated to a newer unit just along the road. Before that it was a Jackson’s, as the worn old signage still faintly indicates. It was probably York’s most badly-laid-out, most inconvenient ‘convenience’ store. It has a stupidly narrow doorway at one side, and once you got inside, it was all overstuffed, with narrow aisles – their width apparently dictated by the impressively ornate Victorian pillars I recall catching glimpses of between the bland shelving. Rugs of the World (currently in Petergate) have recently submitted an application to re-order the shopfront, to restore it to something like it used to be. As shown on the photo, it’s clear that the doorway was in the middle of the facade, originally. The most interesting detail in the plan is the suggestion that the original shop doors, or at least very old shop doors, have been ’stored inside’ the premises. I’ve got an old door cluttering up my small garden shed, because I admired the joinery and the solidness of it, and wanted it to stay around in case it was of use in the future. So I salute whoever it was who saved the old doors, and I salute the 21st century citizens who want to put them back in. The relevant planning application documents are available to view on the CoYC website, including the ‘Design and Access/Heritage Statement’ – which includes interesting historical information – and the plan of proposed alterations. walked past it thousands of times, shopped in it hundreds of times, never once noticed the shop front and where the door used to be…. it takes someone to draw my attetion to these things! i’ll have a proper look when i next go by it, and I hope ‘Rugs of the World’ are able to do credit to this building, good luck to them. Thanks for your kind comments, Drake and Mallory. Makes it all worthwhile.